I am asked routinely how to choose the right rapier for practice. This article, cribbed from my forthcoming Introduction to the Italian Rapier book, looks at the range of historical rapiers and my opinion on how to best select a modern reproduction. Historical rapiers varied in dimension both throughout their evolution from the early 1500s to the 1700s and within any given period, based on the usage and physical size of their wielders. Different historical masters advocated differing weights, lengths, and balances. The swords shown in Agrippa’s 1553 manual are shorter in blade than those of later authors, at about one and a half arm lengths (when compared to his models). 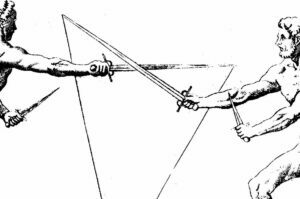 In perhaps the peak of the Italian rapier era (the early 1600s), Capo Ferro, Giganti, and Fabris show blades of at least two arm lengths. 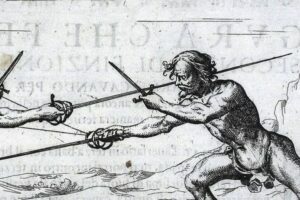 However, some contemporaries to these authors, such as Vincentio Saviolo (his manual published in 1595), show images with rapiers that are broader bladed and potentially even longer. In museum collections relating to rapiers of the early 1600s you can find examples that range in overall length between 40″ to 70″. We also know that blade length restrictions were brought into many European cities, most notably London in 1566 when a young Queen Elizabeth restricted the blade length of rapiers to approximately 40″ (“one yard and half-a-quarter”)—I’ve included this proclamation below. This was perhaps a statement of support toward the shorter and more English broadsword and backsword and against duelling, which was a more continental fashion, often done with rapiers. In my experience, rapiers have a surprisingly broad range of weights from as light as two pounds to as heavy as five and half. The weight can be from the blade itself or based on the weight and complexity of the hilt and pommel. In a study by Florian Fortner and Julian Schrattenecker that compared 7 historical rapiers to modern reproduction swords, their studied examples had a range in weight between 1130 g (2.5 lbs) and 1630 g (3.5 lbs) and thickness at the ricasso ranged between 8.3 mm (.32″) and 10.3 mm (.41″) and width between 14.7 mm (.58″) and 24.4 mm (.96″). What often makes a blade feel heavy or light is where on its length you find its center of balance (the point where you can balance the rapier and it will hold an equilibrium between its hilt and point). Rapiers in the study had balance points from 3.7” to 6.1” from the hilt. Careful examination of sword hilts in rapier manuals varies from simple cross bars and rings around the fingers to much more complex hilts that include sweeps and plates on both sides of the blade. 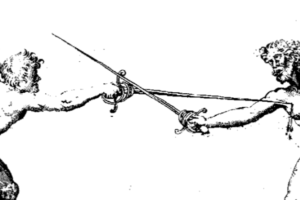 A figure from the manual of Camillo Agrippa, 1553, holds a short and simple hilted rapier. The rapiers in the manual of Salvator Fabris, 1606, are long and feature complex hilts. Ridolfo Capo Ferro in his 1610 manual advocated that a rapier’s length be from armpit to floor when standing erect. What this historical diversity means is that, as a modern practitioner, you have a very broad range of choices when it comes to an historically accurate rapier. An important thing emphasized both by historical masters and this author is that your rapier should suit your build and your capabilities. Length certainly has the advantage of being able to reach farther but it can also be much more challenging to maneuver and presents a much longer lever to your opponent. 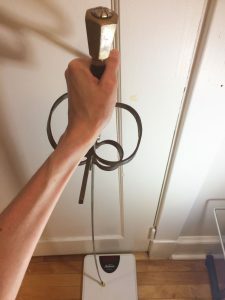 Though I have worked with rapiers as long as those advocated by Capo Ferro, I think having a rapier whose quillons (crossbar) come up to your belly button, when the point is resting on the floor, provides a good and manageable blade length for most practitioners (typically between 39” and 45”). The rapier system I present is best suited for more slender, thrusting oriented, weapons that are between 2 and 4 lbs in overall weight with complex hilts (sweepings or rings). I recommend that you have a balance point along the blade of between 2 and 5 inches from the hilt. If the balance point is too far back into the handle your sword will be too easily pushed around by your opponent. Ensure that the blade is flexible enough not to hurt too much when you strike but firm enough not to wobble when you move it through the air or interact with another weapon. A good test for a rapier’s flexibility is to hold the sword by the grip and place the sword against a home scale. Apply about two pounds of pressure. The blade should bend off the centerline between one and two inches. Preferably this bend will occur in the third of the blade closest to the point, which is the focal point for striking with the weapon. Two inches of deflection from the centerline under two pounds of pressure on the scale. You can also get a feel for the blade by maneuvering it through the air or attempting to cause the blade to wobble. If the blade oscillates excessively or, when held straight with the flat towards the ground, bends more than a small degree under the weight of its own point, it is probably too flexible for effective use. If you are currently practicing with a particular organization or school check with your instructor or your organization guidebook to find out which makers are being used or are approved for use. Not all groups practice with the same types of equipment. It is important that you are using something compatible with your group’s rules and style of play. At Academie Duello we use rebated rapier blades made by several different makers, notably: Cas Iberia/Hanwei, Darkwood Armory, Del Tin Armi Antiche, Castille Armory, and Marco Danelli. On the end of the rapier we affix an archery blunt (a rubber stopper) you can typically find at archery supply stores or order online. Blades and their makers change all the time, so if you’re reading this article some years from now, best to check in on the current state of the industry. However, these guidelines should still be relevant for making your selection. The full details of why this proclamation came about bears further research. Update: Thanks to readers Ville Siivola and Sean Manion for each sending a link to an article by Puck and Mary Curtis that shares a similar proclamation made two years earlier by Phillip II of Spain. Check that article out here.